In churches every week, you will hear one of two messages. You will either hear a mixed-grace gospel or you will hear the hyper-grace gospel. A mixed-grace gospel combines the unmerited favor of God with the merited wage of human-effort. “You are saved by grace but you maintain your position through right-living,” is an example of a mixed-grace message. “God gives you grace so that you can keep His commands,” is another. These sorts of messages contain an element of grace but ultimately push you to trust in yourself and your own efforts. Any mixed-grace message can be recognized by the presence of carrots and sticks. 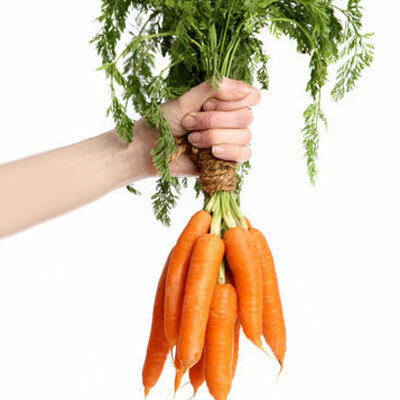 Carrots are the blessings you get for obedience; sticks are the penalties you pay for disobedience. The modern mixed-grace message offers the following carrots: If you confess, you’ll be forgiven; if you do right, you’ll be accepted; if you act holy, you’ll be holy. And what happens if you don’t do these things? What are the sticks of the mixed-grace message? Fail to perform according to prevailing codes of conduct and you’ll lose your forgiveness, you’ll lose your fellowship, and, if worse comes to worse, you may lose your salvation. None of this sounds like good news to me. Yet tragically this is the sort of message that millions of people hear every week. They don’t hear about Jesus; they hear about carrots and sticks. Bite into any mixed-grace message and you will taste a bitter fruit. You will feel the pressure to perform and smell the fear that comes with failure. You’ll make promises to God and then you’ll break them. You’ll resolve to try harder only to fail again and again. You’ll become burned out and bummed out. Since a mixed-grace message puts the emphasis on you and what you have done, your identity will become defined by your productivity. You will start to think of yourself as God’s servant instead of His beloved son or daughter. Worst of all, you will end up distracted from Jesus and fallen from grace. You may have heard that God gives us grace in order to do good works, but this is misleading. God does not give you grace so that you can work. He gives you grace because He loves you. Period. Those who receive from the abundance of His grace do indeed work and often they work harder than anyone else, but that’s neither here nor there. The issue is not what you’ll do for God but what you’ll let Him do for you. Will you trust Him a little bit or will you trust Him the whole way? Does His grace merely get you in the front door or does it keep you safe to the very end? As Jesus said, the only work that counts is the “work” of believing in the One He has sent (John 6:29). This is the chief takeaway of the hyper-grace gospel. Adapted from The Hyper-Grace Gospel, pp.15-18. And if you’d like to see these hypergrace messages of grace and freedom go further, support us via our Patreon page. Until this sentence is understood I don’t think one can have a proper understanding of grace. I agree. Understanding this has become the greatest revelation of my walk with the Lord. I only wish I would have come to this realization much sooner. It would have prevented many years of angst and guilt. I believe in the Gospel of Grace and I thank God ffor the recent revolution that aims at refocusing the church to the true gospel. However, I still notice with concern that most grace preachers still put their churches under the burden and guilt of tithing which was strictly for the jews and part of the old convenant. What can you say about this? Or is it grace plus tithe? There’s is a teaching on tithing that I can recommend… If you can get Joseph Prince’s message on “Benefits of Tithing and/or God’s Secret on Tithing” you’ll be greatly blessed by it and you’ll learn about what tithing really means…. Under grace you don’t tith because you have to but because you get to. Attitude of gratitude not guilt. Disagree. Ugo odimba is correct and that is one thing Joseph Prince is not correct in his teaching in the tithe. Jesus fulfilled the tithe. Bertie Brits has some solid teaching on this. I don’t think I’ve found a church EVER that doesn’t have some sort of mixed message. Even IF the Pastor speaks a grace filled message and that’s a big IF, maybe the person speaking about the offering throws in the law or a religious person shouts a prophetic word that is full of Law. I think it is extremely rare to get out of a service without some mixture. It causes me to spend less time going to church honestly. I don’t need to be kicked down anymore or taught to kick myself down. Once you have sampled the pure grace of God you will always have a taste for it and will recognize the mixed grace message in every setting. I like that,” Eat the meat and spit out the bones”. I knew a guy who was bummed out and burned out by a gospel of mixture. When Jesus showed him the one and only true gospel of pure grace, he realized the only people who were not bummed out and burned out by this human blend were the ones who fooled themselves into thinking they had achieved their goodness. I actually listened to a preacher this morning that I used to love (before Grace). He was basically telling the people that in order to get the privilege of God’s presence you have to put forth an effort by praying a whole lot. He scolded the people for getting on twitter, and watching tv 4 hours a day because you cant have a great relationship with God if you are doing these things. This gave me a righteous anger. This is not the Gospel, it’s a heavy yoke. Your article was timely, sir, thank you! If it’s true that all roads lead to Rome it is also true all mixed grace messages inevitably lead back to obsession with self which is just more self worship and idolatry. Ironic isn’t it? So true. Woohoo…love this!! Keep preaching the GOOD news!! Hallelujah!! My wife and I belonged to a local baptist church for about 4 yrs. About a year ago, we started tuning in to creflo dollar and Joseph prince. We had missedaa few Sundays of church, but at the same time, were being led by the Holy Spirit to freedom and the liberty of Christ..and BAM!!! I received revelation of the truth.He delivered us from the mixture of Grace and works, and at the same time, the veil was lifted…I thank God through Jesus Christ for the Grace Ministry..I know that we’re persecuted for the freedom that we have in Christ, and I leap for joy, for I’m no longer a people-pleaser, but a true Believer!! Praise God, what a Gift.. The Gospel of Christ is the Gospel of Grace.There is not another!! Hi Paul. Thanks for your posts and encouragement on hyper grace. I embrace sonship and its amazing blessings. A question I have is how does character development fit into the grace message. It is not an easy process to change wrong thinking and ingrained habits. It would be great to have some practical examples of how you see grace doing this without us getting into a performance mode. I think that is the crux issue for many. It is the issue of sanctification. The part God plays and the part we play. How does it really work. Glorification is great and amazing but the sanctification side is the tricky stuff since we have a part to play. Good question Mark. I think we are probably all familiar with the wrong way to go about this – lay down a list of rules and say “I must become this person.” If you fail you’re condemned or shamed; if you succeed you are tempted with pride. Sanctification is something to work out in the context of a loving relationship with our heavenly Father and those who know him. I think the danger is we can over-think this. Consider marriage as an example. We all desire good, strong marriages, but how do we make that happen? The answer is, we don’t – not consciously at least. Marriage is not a problem to solve but a gift to enjoy. As we walk in love with our marriage partner and with trust in God, a good marriage just happens, like fruit growing on a healthy tree. For this reason, I don’t think we need to teach sanctification, per se, as much as we need to see Jesus and his beauty in every aspect of our lives. Whatever your need – whether it’s a healthy marriage, a good character, or sanctification – your supply is found in a greater revelation of Jesus and what he has already given you through his grace (Phm 1:6). Jesus didn’t lecture Zacchaeus on character development; he just became his friend and Zacchaeus changed. If I was to teach a course on sanctification, I’d just teach on Jesus. But that’s all I’d ever teach. I’ve got a one-track mind that way. One word will do EXCELLENT! Thanks Paul. Always look forward to your posts. I’m appreciative you make it easy to understand and challenging at the same time! It is SO encouraging to hear that others with a ” platform” understand the one party New Covenant of grace we are born again into. The same two things neglected by the children of Israel are the same two things neglected by today’s Body of Christ; the Covenant and the Priesthood!! Amen brother, it’s ALL about Jesus and His New Covenant blood! Ministering unto The Lord is our first ministry and ultimate destiny. Blessings. For the past three plus years, I’ve had to work Sundays. I hated it. But since last year when I received your book, The Gospel in Ten Words, I’m pretty much OK with that! Lets face it, for the bulk of the 35 years I’ve been saved, I heard basically nothing but mixed-grace messages. I was fortunate to work only a half day this past Easter and meet my family at church. As I was sitting there, I thought, man, every Sunday should be an Easter message. It’s the only time most churches seem to get it right! God bless you Paul, and praise to our Lord Jesus Christ! You said… that if you receive His Grace, you do indeed work, and possibly harder than anyone else, but “that is neither here nor there”. Since Paul talked about working “harder” than anyone else, in terms of God’s Grace to do so and being a fool (1 Corinthians 15:10 and 2 Corinthians 11:23), do you have any posts about that kind of work? Can you at least describe this kind of work, and show what type of language you would use to talk about this kind of “work”, even as Paul did? Paul was referring to the happy privilege of telling people the good news of God’s grace and seeing them grow in grace (a.k.a. the Great Commission). that was under the law, strictly Jewish and has been put aside by Christ with the commission He gave Paul the apostle to the Gentiles. Sheeeeeshhh! The 12 apostles went back to Jerusalem to await the coming of the Lord, the disciples were dispersed and died off; while Paul and his associates went out to the world with the message of the cross, NOT water baptism and all the Judaic laws and liturgies. I have never heard anyone dismiss the Great Commission as old covenant. Are you saying Jesus doesn’t want us to preach the good news to all creation (Mk 16:15)? Nicol- the great commission a Jewish Command under Law??? Really???? This passage above is the great commission . So that was only given to Jews? So Jesus didn’t really mean “make followers of EVERY NATION”?? So Jesus doesn’t really want us to baptize anymore? So Jesus didn’t really want us “teaching THEM to obey EVERYTHING I commanded you.”??? So the Jews were only given the time period between Jesus reasurection and Paul’s conversion to make followers of ALL nations??? So what was supposed to happen to all if these disciples who they were commanded by Jesus to make followers of? I’m not sure where you are getting your teaching from my Dear but you need to read your Bible for yourself. I’m not trying to trap you, but I don’t know how to hold this conviction. I don’t believe I’m being taught grace the way it first seemed to work. It’s actually surprising and scary. I never could make sense of everything I was taught, what is business and ministry going to do, if the gospel of grace takes the planks out of our eyes what will we see? Benjamin means “son of my love” – I have discovered that grace is an expression of Gods love for us and for those around us. When Paul speaks of grace enabling him to work harder than all the saints I believe his secret was basking fully in Gods deep oceon of love for him personally. The spontaneous result of Paul’s constant basking restfully in Gods unconditional love for himself was that that same love Paul drank deeply of each day filled him, overflowed in him and spilled out to others as “I worked harder than all the saints”. This “work” Paul spoke of was not “works” but the divine work of divine love through Paul. “We love because He first loves us” (I Jn 4) We work because He first loves us. We work harder than any of the saints when we first bask in Gods unfathomable unconditional love for us. Works is working to earn love. Working by grace is simply the spontaneous and effortless overflow of having accepted and recieved Gods love for us. Our work is to learn to trust in Gods unconditional love through Jesus plus nothing else. Both compulsive serving and laziness in the church has the same source- a failure to recieve and bask in Gods love. Love never fails! Everything else fails. Sanctification like justification is only received by faith, by Gods work for his Glory, you first have to believe it apart from yourself, you have to lose yourself and find Gods righteousness,believe it in you , God only works in holy people and the only way to become holy is by God not yourself.It is an easy yoke just believe it and watch the miricales God will perform to mould you into your new identity. I have discovered that faith is nothing more than confidence in Gods love. When I realize Gods love for me I trust Him- not until them. My faith for both justification and sanctification has one source and grows in one soil only- the soil of the intimate knowledge of Gods unconditional and infinite love for me. If I approach either my justification or sanctification from any other perspective than this ever speaking word from God “Barry I love you!” I have little or no faith. ONE THING REMAINS! To know that God loves us no matter what. When we speak of the glorious doctrines of grace, justification and sanctification without being saturated with the inner knowledge of Gods present burning blazing joyful love toward us we have missed their meaning and purpose entirely. These doctrines are meant to be tender expressions of the unquenchable first passion of the one and only true and living God through Jesus Christ out Lord. Where there is no fire of divine love in our breast there is little or grasp of the doctrines of grace. Yes Barry faith is exactly what you say , there is not one man or woman on earth that does not believe there is God, God himself says that no one will be without excuse. There is sufficient witness of the creator and of one creator, It is not that men do not believe there is God they do not believe who he is, his character, that he is love, pride and self righteousness causes them to deny him, they may say they do not believe there is a God , I have found this always to be a lie,covering the inability to believe that God is good, that he loves them.So yes I agree with all you have said.Faith is the belief in Gods essence, it was what Adam and Eve were decieved into questioning through arrogance and pride, born of the law.Love for work.We unlike them do not have to hide in the bushes but can come out naked and say God we know what we deserve but we also KNOW that you are love and will cover our sin and even rescue us from death for you are life.Let this be the eternal attitude of our hearts.And the price paid for this KNOWING priceless !!! So now we walk confident , without doubt, KNOWING our God through his son Jesus. This has been my biggest issue to overcome – exposing myself to Gods love- taking the risk on His love- becoming completely vulnerable and transparent before His blazing love. Yet I find this cursed propensity within me to hide, to withhold my heart, to settle back into the deceptive false safety of self effort, self will and self protection . This is why most folk resist the message of grace- it’s too vulnerable – too out of their control – too risky to have nothing covering themselves but Gods unconditional love in Jesus when they face His terrible holiness and perfection. John Wimber used to say faith is spelled R-I-S-K in the Bible . I encountered a man this week who told me that I am sinning because I observe the Sabbath on Sunday instead of Saturday, and that this is breaking God’s holy fourth commandment. This man spoke to me of unforgivable sin, being good, etc. I am thankful that this blog had given me some wonderful messages of grace to share with this brother. I told him about the words of Jesus on the cross “Paid in full!” and suggested that he focus more on Jesus than on a particular day of the week. He said to me that he could see I was a “good, genuine person”. I told him no, there is nothing “good or genuine” in me apart from Christ, but that Christ in me is both! I was sad and disturbed that I could not convince him that Jesus was, as I put it, “enough”. He kept referring me to the commandments and bashing other denominations, to the point where I asked him gently: “Do you ever PRAY for them with whom you disagree?” He said yes, after briefly seeming surprised at the question. I think we disagreed about the meaning of Jesus’ having come to “fulfill the Law” as well…I told him Jesus fulfilled it because I could not! and he believed that the Holy Spirit was given us so that we could keep the Law (i.e., the 10 Commandments). I told him to read this blog! where it talks about abiding in the vine and being “lifted up”, not “cut off”…he had never heard of such a thing. He left VERY frustrated with me. I believe that Messiah came to ‘fill up’ the law,not only to fulfill the law,as the law was powerless to not save anyone,nor could the law bring forgiveness of sin(s). The law also could not make anyone righteous,holy,just,nor could they be sanctified by obeying the law. The law was not given to be obeyed,but rather to show the sinfulness of man,and the need for someone ( Messiah) to redeem fallen man out from being under the wrath of GOD Almighty,and from being under the law. Grace has been what GOD Almighty has been telling man,and showing man since the garden.Just look at the Grace of GOD when He clothed Adam and Eve after they did not believe His Word to them about the tree of knowledge of good and evil. Also Elohim put a flaming sword to keep them from eating from the tree of life,this is Grace to keep man from living eternally with a sinful nature,without any means of redemption. Thank you for commenting, George. I love what you wrote about the Grace of GOD clothing them even after they disobeyed. How great and kind a GOD we serve! Shalom to you as well. Paul, I am really struggling with getting my head around grace and believing that Jesus has saved me no matter what I do. I’m feeling massively condemned and even though I keep repeating to myself that I’m saved through faith, not works, I keep thinking ‘Well I wouldn’t be feeling condemned if I believed that Jesus has saved me’ and I worry that when it’s judgement day Jesus will turn me away saying he never knew me because I didn’t believe enough. Then I go round in circles feeling worse. How can I believe and be secure and KNOW in my soul that I’m saved?!? Thanks for your question. Many people on the road to grace go through similar turmoil. Let me say this: you can’t control what you think, but you can control what you believe. Understand that thoughts of condemnation and guilt are not coming from your loving Father. The Bible declares that Jesus died for us, while we were sinners (Rom 5:8). He didn’t wait until we got cleaned up and well-behaved. He loves us without regard for our behavior. This is the good news! The Bible also declares that there is no condemnation in Christ Jesus. If you have called upon the name of the Lord, you are His. Those condemning thoughts are lies. They are not truth. They are like pigeons pooping on your brain. (Forgive the picture but I feel it’s appropriate.) Shoo them away. Remind yourself of the many promises of God toward you. Right now you are in a battle, but by the grace of God it is a battle you can win! God is for you you; these lying thoughts don’t stand a chance! Thanks Paul, I’m sick with worry right now, I can’t sleep or eat. How can I reconcile the verse in John where Jesus says ‘I will never drive away those who come to me’ with the verse in Matthew when he says ‘Then I will tell them plainly, away from me you evildoers, I never knew you.’ He says he’ll say it those whose who don’t do the will of his Father in Heaven. Does that mean obeying all the rules or just believing? Jesus tells us that the “Father’s will is that everyone who looks to the Son and believes in him shall have eternal life, and I will raise him up at the last day” (Joh 6:40). God’s desire is not for you to perish but to believe in Jesus and live. The evildoers of Matthew 7 are those who refuse to do the will of the Father, which is to believe in Jesus. This is why Jesus says of them, “I never knew you.” He didn’t know them and then forget them – he never knew them. But Jesus knows you. He has taken you by the hand and he will never let you go. To combat your worry, I encourage you to proclaim these promises of God over yourself. Preach God’s grace to yourself and faith will come, because God’s grace is wrapped in faith. Utter- this helped me – we are not saved by out faith or our trust in Jesus – we are saved by his grace alone. Nothing you do not nothing you believe saves you- He alone initiated your salvation by his grace alone and He alone will keep you. Neither your utter turmoil nor your perfect trust effects your salvation. Barry…your statement confuses me. Perhaps I am reading it incorrectly. I’m thinking you cannot be saved without believing, else everyone would be saved. Could you clarify what you said? How do you read that statement? Even though it is through gifted Faith – faith is not meritorious in saving us – grace is the ONLY basis of our salvation . Our faith even though given to us as a divine gift is fluid , it can diminish or increases- our faith is not the foundation of our eternal security but grace IS. Paul You are a real blessing to the body of Jesus. You constantly wash our feet. I really enjoy your writing style. It is really easy to read and understand, engaging and profound but also simple to grasp. Your books The hyper grace gospel. The gospel in twenty Qs and The gospel in ten words are Christian classics and have a wealth of revelation of freedom. Do you have anything on Holiness and living right the grace way. I know we are forgiven and holy etc. But how do you tie it all in with living a life pleasing to God and not giving the devil a toe hold in our lives when we sin. Does one who hasn’t been able to get free from a sin open themselves up to the enemy? Many many thanks for You and your lovely family Paul. PS sorry if this isn’t the right place to post this but couldn’t really see one. Cheers! That sounds like a question for Andrew Wommack. 🙂 He talks about sin opening the door to the devil. What does it mean to live right? It’s living loved. I firmly believe that if you spend each day receiving your Father’s love and responding to his love, everything else will take care of itself. If you need more practical handles, I recommend the New Testament epistles. They show us what it means to walk by the Spirit in contrast with walking after the old ways of the flesh. Don’t read the NT exhortations as commands that must be obeyed. Rather, seem them as pictures of the life Jesus wants to live through you. They should inspire you, never condemn you. The primary issue behind whether believers embrace a pure grace gospel or a mixed grace gospel is determined by how they attempt to secure and maintain a clear conscience on a daily basis. The Bible teaches there are two mutually exclusive means of acquiring and maintaining a clear conscience namely; behavior or blood! The Bible clearly presents these two as mutually exclusive . Every believer by virtue of his new birth and his regeneration has a fully functioning acute conscience which becomes to him a perpetual moral compass. Herein lies the problem . If he attempts to secure and maintain a clear conscience by his behavior, by his performance, by his obedience, by his confession or by his repentance he will be constantly overwhelmed with a guilty conscience because every believer fails miserably at all of these things! This is the essence of the mixed grace gospel- attempting to maintain a clear conscience each day based upon behavior . Barry, thanks for your comment. Unfortunately I had to trim it as it violated E2R’s comment policy. I appreciate you have a lot to say but these discussion threads may not be the place to say it. (I highly recommend blogging!) Thanks. Barry, that is very well said! And if I understood you correctly, that’s what has been revealed to me as truth also. Knowing this has brought me the peace that the whole world is seeking after, and it’s delicious! So freeing from self. Isn’t it ironic that Christians try to “die to self” all day long, by making sure they don’t accommodate thier own desires…. But the killing of self is the opposite of that, and looking at my actions to discern whether I qualify or not, keeps me tightly attached to “SELF”. Wow. Thanks. How does John 6:29 cover Matt 7:21-23? In Matthew 22 Jesus definitely says good works don’t guarantee you to enter in pot the Kingdom of Heaven, also notice that they are works done by the Holy Spirit! In 23 He says why these people won’t enter, “depart from me you who work iniquity”. So is this “work” the one that Jesus was talking about in verse 21? We can’t just read a few verses that we like and ignore the hard ones. PS I’m not sure about your comment policy so I only encourage readers to find out for themselves, there is a resounding will of God that is no different in both covenants. I want to share this in another language. Wasn’t there an option for translate? Thanks Paulette, and welcome to E2R! I saw you posted this question on Facebook and that’s really an ideal place to post questions (I have shared some of my thoughts), since these threads are limited to the posts being discussion. The Scripture in Matthew 7 needs to be translated correctly,as the English has been botched. When translated correctly;the people in verse 22 are really saying ‘We did not prophesy,cast out demons,or do works of power in your name or rather to your name. This is why Yeshua says that He NEVER had known them,He did not know them in the past,nor presently,and He will not know them in the future. The Greek word here for ‘know’ is ginosko. i too,had never heard that interpretation,but would add that just because none of our English Bibles say that,not to write it off.I read a book,”the Great Ecclesiastical Conspiracy”,that opened my eyes to errors in translation in our English Bibles,(purposeful in the case of that book). A simple study using a strongs concordance and Vines dictionary looking up those scriptures in question,proved to me that indeed they had been altered by the translators to better suit their own agenda. Interesting article, haven’t read the book, so I appreciate it maybe fills in the blanks! Yes we have grace, but we also have responsibility. “Unless I wash you, you will have no part with me”?! 1. Salvation is a work of God (full stop). 2. God is always willing to forgive (apart fro blasphemy against the Holy Spirit of course).In fact when we come looking for it He RUNS to forgive! 3. His mercies are new EVERY morning! There is NO limit to this OUTRAGEOUS grace!!! 4. This grace (or can we say forgiveness) that He offers TODAY to cleanse us of our sin needs to be received. And before we can receive it we need to accept our need of it. 4. This has nothing to do with salvation, but everything to do with right standing. We can be His, and we can also be used by Him. But both are not automatic. Jesus illustrates this clearly in John 13. Example: You might have a large spoon amongst your kitchen utensils, it’s part of the ‘family of utensils.’ But there’s no way you’re going to use it for breakfast preparation if it’s stained with last night’s soup! It needs a wash! But not the whole spoon, just the bit that gets caught up with stuff! Remaining dirty the spoon is still part of the utensil gang, it’s not getting thrown out! But it’s not getting used for breakfast either! Mixed grace? Well if we put it in context NO! More like two aspects of grace…. I appreciate the “carrots and sticks” explanation, as it’s easy to remember and hence forth easy to spot!!!. This is what makes the difference between religion and relationship. I didn’t receive the Lord because I wanted religion but because I wanted a relationship, as he does. Thank you Paul. Weder u believe it or not today, you will undrstand that grace soon.. dont put a period as of the moment. Let the Holy Spirit teach that for you. Once you got it, surely your words will be more powerfull because its not from your knowledge anymore but from the Holy Spirit. Its only by Grace we are saved. Works are output of Holy Spirit that is in us that was given to us by Jesus. All honor and glory belongs to Jesus, Holy Spirit, and Father. l strongly agree before l was fed with poison that l have to do to get to God!but l ended being worse! I am performing the wedding ceremony (charge and vows) at one of my daughters wedding today was praying about what the Lord wanted me to say and I just “happenned” to recieve some comments on this most precious article. Then I read Pauls analalgy of our relationship of complete acceptance and enjoyment of relationship with God being like a marraige of acceptance or a marraige that you make into a “problem to solve”. Wow! Best marraige advice anyone ever could give . The day I started to accept my wife as she is in grace is the day my my wife and my marraige became the most enjoyable blessing of my life. Likewise one can enjoy God until they accept His unconditional acceptance of them the way they are because of the gospel! The key to happy disciples and happy marraiges. I’ve been having tones of pain with this. The mixed-grace is right along with the hyper-grace. I guess you mean that we need to just choose the better. I know what Eugene Peterson says in the Message to Romans. Is that right? I’m confused about something. In this article, you say, “sticks are the penalties you pay for disobedience,” but then in another article you say, “Your sin won’t undo the work of the cross, but it could undo you, your marriage, and your family.” Since sin is disobedience, wouldn’t you consider the undoing of you, your marriage, and your family to be a “penalty you pay for disobedience”? Or do you see those things as blessings? The consequences of sin are real and destructive. In contrast, the sticks waved by angry religious folk are imaginary. If you sin, your heavenly Father will not unforgiven you, unchild you, or unsave you. He will never leave nor forsake you. but why do you not consider the consequences of sin to be “penalties you pay for disobedience”? From your article, it defines a mixed gospel as anything that suggests there are penalties you pay for disobedience, but if i were to mention that sin has real and destructive consequences, according to this article, I’d be preaching a mixed gospel. You wouldn’t, but you would be confusing consequences with penalties. If you drive your car drunk and kill someone, their death is a consequence of your sin. But when the judge cancels your license and throws you in jail, that’s a penalty. In sport if you injure a player, the injury is a consequence; your red card and suspension is the penalty. A penalty, by definition, is a punishment and any punishment implies a Punisher, which God is not. The examples of penalties I list in the article are exactly the sorts of penalties/punishments a mixed-up preacher uses to threaten the saints. These penalties are fictitious. Personally, I think you should change “penalty” to “punishment” because I’m not aware of any restrictions that keep “consequences” from coming from a punisher. Also, sin causes us to lose fellowship not because God is punishing us, or because He hates us, or because He wants to lose fellowship, or because He even chooses to, but because He simply cannot fellowship with sin. God the Father even had to withdraw His presence from Jesus, when Jesus became sin on the cross! That’s what repentance is for: cleansing our sins so we can get His presence back again. It’s a myth that sin causes God to withdraw from us. A believer is in connate and unbreakable union with the Lord. God’s best is greater than our worst; his grace is greater than our sin. Have you not read how Jesus fellowshipped with sinners? Although we may feel alienated from his presence at times, his promises (to never leave us) trump our feelings. God withdrawing His presence from Jesus on the cross is not a myth. It is a real event. If it happened to Jesus, how could it not happen to us? Yes He’s always “with” us, but to suggest His Spirit can be “in” us, along with our sin, is very dangerous. Jesus gave us the gift of repentance so we could walk in continual fellowship with Him, no matter the frequency or severity of our sin. Because of grace, if we sin, His indwelling is just a humbling-yourself-and-repenting away (unlike under the law)! It’s a far better strategy to walk in daily repentance, than to insinuate the Holy Spirit is not actually Holy. Don’t you see? Because it happened to Jesus, it can’t happen to us. Jesus was punished so that in him you might be eternally unpunishable. “The punishment that brought us peace was on him” (Is 53:5). You are not holy because you repent; you are holy because Jesus the Vine is holy and you are part of the Vine. There are no unholy members in the body of Christ. You repentance adds nothing to the grace of God. All your repentance does is help you receive and walk in what Christ has done. Repentance is not something we do in response to sin; it’s what we do in response to love. When you sin, God doesn’t pout or walk away. That’s simply not scriptural. Search the gospels and you will not find one sinner that Jesus refused to fellowship with. His grace is far greater than our sin. He does not hold transgressions against us for love keeps no record of wrongs. This good news is supposed to make you happy! To suggest the Holy Spirit is always in us is not dangerous, but 100% scriptural. In the old covenant he came and went; in the new he has promised to never leave. Never means never. Your part is to repent from unbelief and trust what Jesus has promised. The word translated as “sin”, when the Greek word is Hamartia or Hamartano, is a positional word, not an action word. If you look up it’s meaning in Thayer’s, the first definition is “not to have a share in”, meaning, not being a part taker in God’s life. Or spirit. In other words, a non believer is a sinner because he has no share in God. But once you believe, you now have a share. Now, you can read passages like 1John 3:9 and it suddenly makes sense. If you have life from God, you can no longer not have life from God, (you cannot sin). It’s dangerous because the Holy Spirit is Holy. To suggest He can dwell with sin is the opposite of Holy. But this is why repentance and Jesus’s blood is such good news! We can walk in continual fellowship with Him! Also, I don’t see the connection you’re suggesting, that if something happened to Jesus that means it can’t happen to us. He became a curse for us, and took our punishment, but sin still has consequences. He didn’t remove sin’s consequences, otherwise there’d be no more suffering in the world. On the cross, Jesus demonstrated for us that one of the consequences of sin, is separation from God. If you’re afraid of the Spirit of Grace, perhaps it is because you have an old covenant definition of holiness. Under the old, you had to avoid sin or you were judged unclean, but then Jesus came and made a beeline for sinners. This is the powerful grace of a good God who does not fear your sins and shortcomings! And he certainly doesn’t break off his union with you when you sin. I encourage you to study what the Lord said about the Holy Spirit. You will be amazed. One last thing: That fellowship with the Lord hinges on your repentance is far from good news. Indeed, it is the most damnable news ever for it contradicts God’s Word and produces either anxiety (did I repent from every sin?) or pride (I did!) in the minds of those who believe it. You may have come to God by grace, but to think you remain by repenting is to insult the very Spirit you brand as dangerous. The Comforter is your friend, not your menace, and it is by his grace alone that you are saved and kept and everything else besides. I urge you to repent and believe the good news. Sticks and carrots are what consist of a mixed grace message not that of Grace. Grace does not mean that you will not sin, it simply means it is not held against you nor should you condemn yourself over it. Man judges one way, God another. Jesus took all of our punishment for all of our sins on the cross. God’s justice was fully satisfied. Instead of us having to pay our sin penalty Jesus paid it with stripes and death. We have earthly consequences for our sins. The Holy Spirit stays within us no matter what. He can do this because 3 things have been done to us. We have been fully justified(Rom 5), have Jesus righteousness imparted to our account(Rom 4) and we have been made holy(Heb 9 & 10). Yes we can still sin but that sin was paid for by the one time blood offering. While it can mess our earthly lives up terribly it cannot taint us spiritually or else Jesus would have to die again to get us new blood to wash ourselves with. That is how the Holy Spirit can stay with us no matter what. Thanks tyler for drawing Paul to share the gospel. Your words were our concerns many years ago. Tyler I’m sure you’ve come to a knowledge of grace. God was in Christ reconciling the world to himself. Anything that says he left him on the cross diminishes God’s goodness and therefore diminishes his holiness and that’s simply not grace. God may have not said anything when his son said, “have You forsaken me?” But the apostle Paul said what he said because that’s the beauty of the blood of every blessing. Be blessed! “”God gives you grace so that you can obey His commands”” IS A MIXED GRACE MESSAGE? Really??? Only in a mythical culture steeped in rebellion and narcissism is God’s grace to obey His commands considered unloving and ungracious “mixture”. One of most loving things the God of love and grace does is issue commands and the most loving and gracious thing the God of love and all grace can do is offer grace to obey those commands. Barry, if you think any of the commands we will be given grace to obey are anything but “believe on him whom he has sent”, if they are from the old covenant law, it is definitely a mixed message. I heard the most beautiful and clearly spoken sermon this morning on what it really means to “establish the law” from Bertie Brits, if it’s ok to mention another grave preacher here…? It was called God hardens pharoahs heart, which, if not understood through the life of Jesus as the exact representation of the Father, can set us up for mixing the two, creating a lukewarm gospel. Blessings, Barry, I have enjoyed your comments on this thread! God issues only one command ?to believe in Him? Really??? There isn’t a single shrewd of biblical reality in that statement my friend. The PRIMARY EXPRESSION of our love for God is expressed in our obedience to his commands (plural). Like I said – one of the most loving and gracious things a God of love and grace can do is issue commands to His beloved children. THE MOST loving and gracious thing He can do is offer grace to obey those commands . Giving grace to obey command Sis NOT a mixture message . It is a fundamental aspect of the hyper grace gospel. You quote 1 John. I bet you do not realize that chapter 3:22-24 also defines what the commands mentioned in chapter 5 are. I have the feeling that the commands you are thinking of is not this all encompassing list. You might be thinking the churchy ones. The read your bible & pray daily, go to church, witness, tithes, don’t sin and do good works. The flesh loves rules and regulations because it strokes the pride. Even the zealous honest sorts who aren’t mini Pharisees look at rules at the barometer of God liking them and where they stand with Him. Yet this robs Jesus as being the all-in-all for our standing and acceptance. God boiled down the entirety of law and commands in scripture down to three basic things. Love Him, Believe in Jesus and Love others. Jesus even said that those walking in love fulfill all the Law and teachings of the Prophets. Did you know that even scripture calls God’s own Law as the ministration of death? (2 Cor 3:7) Part of Romans 7 is Paul’s internal war between wanting to stop sinning yet having sin revived within him because of the Law. There is no grace or love in ordering people to do what they cannot. This ties in with the Laws written on our hearts you mentioned before in Hebrews 8. We don’t have a set of rules imprinted on our minds to check off as we obey. They are written on our hearts, our nature. We are a new creation in Christ. That is the love and grace of God. He bypassed the flesh and its failings(mentioned in that same Hebrews 8 passage) and went straight to the core. God would just be perpetuating the same problems He had with the Hebrews and the Law if all He did was write up a bunch of rules and give them to folks. Isn’t the definition of insanity doing the same thing over and expecting different results? “But grace” I hear you say. Grace is another way to say favor or mercy depending on teh context. Ask yourself. Is God really giving people mercy or His favor to disobey His commands because He knows they cannot obey? I’m thinking of the daily and moment by moment commands required for following Jesus intimately and personally everyday just as he obeyed His Fathers commands moment by moment every day. I’m thinking of the inner commands involved in walking in the Spirit. We don’t live independently making choices to do whatever we think should be done . We listen to Jesus, we listen for his commands and we do them – each day, sometimes each moment. Me sheep hear My voice and they follow me. These aren’t ‘churchy commands’ as you imagine. They are the commands of our shepherd – whom we listen to and carry out – just as Jesus obeyed His Fathers voice and carried out His Father’s commands. ‭‭HE WASNT REFERUNG TO “churchy commands”. If all you ever heard these daily commands being led by them from within by Gods grace you don’t know Jesus. It’s all a difference in terminology and mental pictures I guess. What you are calling commands most people see as relationship. Just as a husband and wife do not have rules for interacting with and loving on each other, most of us see our walk with Jesus in the same light. Yes there are things a loving husband and wife should do or avoid doing but it flows out of their love not because they are obeying a list of commands. I think there is an article here basically explaining that point. I do not avoid murder, or hating my neighbor because I hear Jesus whispering in my ear not to. I just don’t because it is part of my new nature. I have discovered an unexpected mercy towards people once I got saved. Walking in the Spirit is not following a litany of commands “Do this…No, no don’t do that.., stop here, go there.”. It is most of all a trust walk that the Spirit will influence you to alter course if you need to. Of course all of us read scriptures exhortations for how we should live but that is how we see them, encouragements to do the right thing, not rules and regulations. Thanks Paul. About this post,sometimes I fear and get mixed up when I compare your sermons and also Joseph Prince sermons versus what my Church teaches. Your messages are full of grace. I fellowship at Good News Mission,which origin is Korea. Every time I attend the service,the message is like “spiritual life starts at the point of failure, that I should see myself as nothing as Isaiah 41:24 so that God can work. Also i need to bend my heart and always seek from Church and servant of God in order to be guided. Examples are given like Esau who did not consult from anyone and that is why he ended up suffering. So for me to be successful like Jacob and Issac I need to ask so that I can be guided. Jacob was blessed because he agreed to be guide by Rebecca (Church) and for our case we should be guided by the church and servant. So i ask elders where is the place of God and also the Holy spirit, and am told that God is a God of order and His blessings have to come from pastor when I listen to him and follow his heart, then that also is the heart of God. Rebecca told Jacob to only obey her voice and so I should obey the voice of Church, and that is why I should trust Church. There is also the emphasis that we get salvation through Church and servant of God and that is why I should never despise Church and the servant, and that is why after salvation God puts be me in Church and be guided by the church,Just like the good Samaritan took the man attacked by robbers on his way to Jericho. Please what about this, is it mixed grace gospel? Greetings Grace Kibe, your Heavenly Father wants to have a very personal relationship directly with you. A pastor or church should not act as a mediator in that relationship. Hi Grace. What you have described sounds weird and unhealthy to me. Jesus said the Holy Spirit would be our guide. We certainly need the fellowship of the body and one of the ways we hear the Holy Spirit is through other believers and good preaching. But to compare the church to duplicitous and conniving Rebecca and then insist we must obey her is strange to me. I don’t mean to stir up trouble, but I believe such a message creates weak and immature Christians.